EPA won’t say which areas don’t meet 70 ppb ozone rule. The Environmental Protection Agency (EPA) won’t yet say which areas of the country do not meet the Obama administration’s 2015 national ambient air quality standard (NAAQS) regulation on ozone according to a November 6, 2017 report from The Hill. 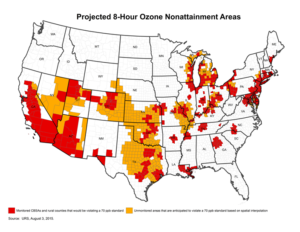 Projected ozone non-attainment areas. Click image to enlarge. On November 6th the agency certified that 2,646 counties, two tribal areas and five territories, or about 85 percent of the nation’s counties, meet the new standard of 70 parts per billion of ozone in ambient air, down from the previous 75 parts per billion. The EPA was required under the Clean Air Act to make all the decisions by October 1, 2017. “In the spirit of cooperative federalism, EPA will continue to work with states and the public to help areas with underlying technical issues, disputed designations, and/or insufficient information,” it said in a statement. The designation list, for example, includes only six of California’s 58 counties. Due largely to geography, California has notoriously bad air quality and high ozone pollution. Ozone is a component in smog, and is linked to respiratory ailments like asthma attacks. It is a byproduct of various pollutants caused by fossil fuel burning. Opponents of the 2015 rule say it would cost billions of dollars to implement, since states would have to restrict fossil fuel use to comply. In June, EPA Administrator, Scott Pruitt said that he would delay the Oct. 1 deadline for attainment designations by a year. Democratic states and environmental groups sued, and Pruitt walked back the delay. He also missed the Oct. 1 deadline initially, causing a similar group of blue states and greens to sue. If an area is designated as “nonattainment,” its state will eventually have to submit a plan to the EPA to improve air quality. If the state does not do so, the EPA is obligated to write a plan itself. EPA officials said they would not yet declare the areas of “nonattainment,” places that exceed the new 70 ppm limit, because they are “not yet prepared.” The EPA was required under the Clean Air Act to make all the decisions by October 1, 2017.